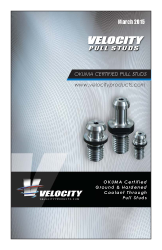 Velocity Okuma Certified pull studs are specifically designed for Okuma spindles. The tolerances and surface finish to which Velocity pull studs are machined results in increased tool life and better part surface finishes. Velocity Okuma Certified pull studs are machined from SNCM 420 (JIS)/4320 (ASTM) alloy steel, hardened to HRC-52 - 58, and all surfaces are finish ground. All Velocity pull studs are coolant through.